I didn’t drink the cat. I just drank him in…with my eyes. It’s been a loooooooong week, so I thought I’d treat myself to an afternoon cider. Reserve all jealousy for the end of the review, please. 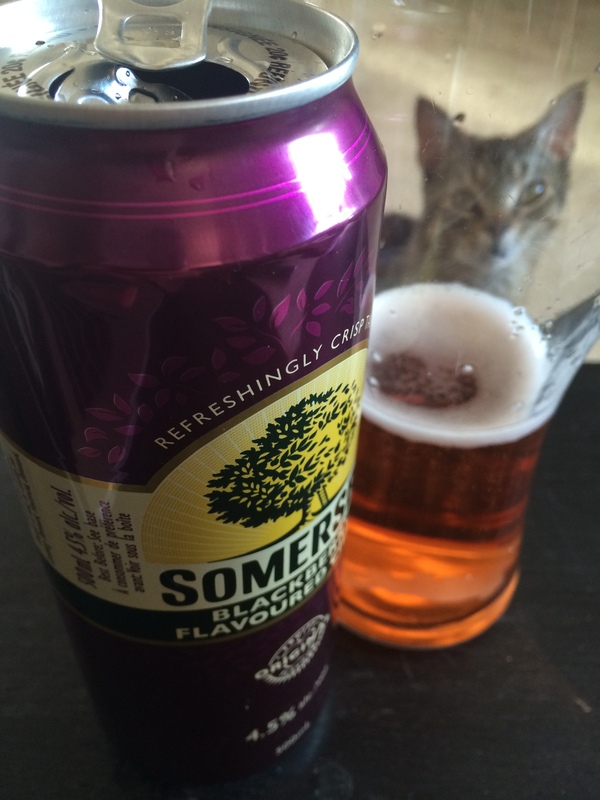 This go ’round I’m reviewing Somersby’s Blackberry Flavoured cider. I feel it’s important to note the vital stats on this one. VITALLY important, you might say. If you are less inclined to make puns, you would (probably) not say that. Ingredients: Water, apple wine (water, glucose syrup, apple juice concentrate), sugar, apple juice concentrate, carbon dioxide, natural flavour, citric acid, potassium sorbate, colour. That’s a, uh, hefty ingredients list. I was extremely disappointed to see… zero amounts of blackberry listed. I guess that might fall into the “natural flavour” category, but that’s a significant way down the list (the list of apple concentrates!!) Maybe I’m just being picky today. The Colour: The photo I took isn’t entirely accurate, as the dark wood shows through the cider and adds a warmth and richness that isn’t there in the glass. It’s an odd sort of green-y pink. If I could name the colour, I’d call it “Electric Watermelon”. The Nose: Sweet. So sweet. Apple-y, but more in the fake-apple way than fresh apples (like those little caramel apple candies). It smells pleasant –a little like berries– and artificial somehow. The Mouthfeel: Subtle. Micro-bubbly. I’m having a hard time describing the carbonation… maybe that means it’s good? It certainly doesn’t seem flat, and it’s not overwhelming. Subtle-bubbles. Subbtles? It leaves a noticeable syrupy film, though. I suspect it’s best served over ice. The Taste: Sweet. Nice. Weird. My first few sips: just sweet and nice. Subsequent sips: sweet and weird. There’s a strange flavour that I can’t exactly place that you catch as it drops off. It doesn’t list artificial flavours, but I’m picking up on a artificial-flavouring vibe. The Verdict: I don’t dislike it. Glowing review, right?! For all the weirdness (syrupy film, artificial-ish flavour) it’s still nice. Certainly easy drinking. Given my druthers, though, on a hot summer’s day I’d prefer a regular Somersby mixed with blackberry syrup. Because I’m high-maintenance like that. Rating: 2 rolls of syrup film or: 5.5 outta 10. Have you tried it? What’d you think? Give ‘er a rating and/or let me know in the comments below. This entry was posted in Cider Review and tagged Apple Cider, Blackberry Cider, Carlsberg, Cider, Cider Review, Denmark, Hard Cider, Somersby, Sweet Cider. Bookmark the permalink.